Part and parcel of making the most of Magento are learning from leading industry authorities and influencers. And we have quite the surprise for you this week. 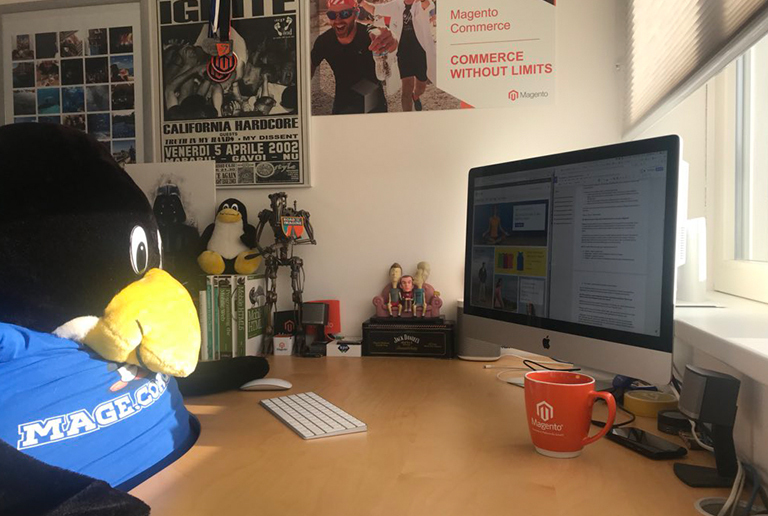 To bring you the best Magento insights, we interviewed Ray Bogman, a highly esteemed influencer in the global Magento community. Ray is the founder and host of Magento User Group Amsterdam and currently working as a Business Solutions Architect at Magento Commerce. He also contributes immensely as a speaker and host for Webperfdays Amsterdam and also as a tech lead for TEDx Amstelveen. He is credited with having more than 10 years of solid Magento experience along with a Magento solution specialist certification to his name. Without further ado, let’s start the interview. Muneeb: Ray, first of all, would you please share your career history with our readers? Ray: Thanks for having me on and doing an interview on ‘Magenticians’. What a great community platform it is. I got started with computers back in the day in 1993. Since then, I have loved hacking hardware/software and writing codes. Although my educational background is in something totally different (Hospitality Management), I kept on hacking codes and hardware. In my final year, I moved to Orlando and finished my internship at the Marriott Orlando World Center. I worked for nearly 3 years in the Hospitality Industry before switching fulltime to the IT Industry in 2000. From there, I started as an ADSL Support Engineer at KPN and joined the open source community in 2001. My first community contribution was with Mambo, now known as Joomla!. During this period, I worked as a Senior Security Officer at KPN telecom and later founded my first company in 2004. From the start, I mainly focused on creating new and maintaining Mambo/Joomla!, training, and fixing hacked websites. Over the years, I have established a couple of Magento related companies (Jira ICT, Yireo, Rapido, and SupportDesk), created many Joomla! and Magento video tutorials, and published various articles for Web Designer Magazine on Magento. For Packtpub, I reviewed a couple of Magento theming and developer books and wrote my first book on Magento 2 titled ‘Magento 2 Cookbook’ with my friend Vladimir Kerkhoff. This really helped me to overcome my dyslexia bump. I’m very glad I did this, it was so much fun and learned a lot during the whole process. I spent 4 months full time on it beside my daily work activities, more than 400 hours of fun! During Magento events worldwide, I love to share as a speaker or help out as the ‘Magento Doctor’. Sharing is Caring! As of January 2018, I have started a new journey working for Magento as a Business Solutions Architect. I look forward to work there, and share with and help as many people as possible. Muneeb: What was your reason behind choosing Magento? What difficulties did you face with your decision and how did you tackle them? Ray: In April 2008, I came across Magento and it was love at first sight. Back then, I mainly used Virtuemart, but Magento was so much cooler, and have used it ever since. As for difficulties, that’s a good question! Well, since it was so much fun working and learning, I don’t think I needed to overcome any issues. Of course, there were issues and bugs related to performance and security, but I never saw this as a bump. I always wanted to know the answer to the issue, and this kept me going. Ever since the start of the first ever Meet Magento event in Utrecht in 2009, meeting, greeting, and sharing has become part of my DNA. And once you start sharing and caring, you will gain so much in return that will keep you Magento blood pumping ;-) . Muneeb: Being a Magento Certified Solution Specialist, what impact did it create for your career and what would your advice be for newbies who want to achieve it? Ray: Being a Magento Certified Solution Specialist, I think it’s a launching pad to achieve so much more. For starters, I think it is really important to know your basic IT stuff. Knowing how the internet really works technically (TCP/IP, OSI, Unix, HTML, Security, Performance, etc…) and combining this with a customer, hospitality, retail, and sales awareness is an ideal formula to become a skilled solution specialist. Magento newbies should focus on some basic guidelines. Firstly, they should install Magento (Open Source and Commerce edition) at least a 100 times Secondly, they need to set up a single, multi-store view, multi catalog, and multi-website, including different currencies and languages. Next, play with all the system config options (shipping, payment, price scopes etc…). And last but not least, install and play with all theme and design options (global, website, store view overrides). I know there is so much more that can be done, but most importantly you should become a Magento Ninja Master of the basics. As Mister Miyagi from Karate Kid says, “Wax on, Wax off ”. Muneeb: What would your advice be for merchants who are moving to Magento? Ray: Magento is a great platform to use but always check if it is the right fit for your business. Although it is really flexible and resilient to last, it’s still not everybody’s fit. Always make sure what kind of business objectives you have and whether your intern and an extern team are in line with your needs. I have seen many merchants out there who thought Magento was the ‘holy grail of ecommerce’ and that it would happen out of the box. But no, those merchants were mistaken. Building a Magento shop is almost the same as building a brick and mortar store. It all starts with the correct fundamentals, which you can continue building after setting up. Before you start, make sure to set S.M.A.R.T goals: Specific (target a specific area), measurable (quantify or at least suggest an indicator of progress), assignable (specify who will do it), realistic (state what results can realistically be achieved given available resources), and time-related (decide when the result(s) can be achieved). But don’t forget, your shop is never done There are always ways to improve new possibilities depending on your marketing and business needs through continuous development. Muneeb: How would you compare Magento with other ecommerce platforms? What is the big difference that makes Magento special from others? Ray: Well, there is a long and short answer to this question. For the long one, I would advise someone to write a book about this topic. There is so much to say about this. To keep it short, I would say it’s flexible, resilient, an open code platform, a great active community, fun to work on, good documentation, provides great contributions, is a large marketplace, and so much more. Looking back 10 years ago, Magento was there at the right time to fill in the big (e)commerce gap. There were popular ‘open source’ systems, such as Oscommerce and Virtuemart, and large “closed” systems, such as Hybris and Intershop, but they were not an option for everybody. Besides, there also was a big pricing and functionality gap. Looking forward, I see the (e)commerce sector growing and growing in terms of more B2C and more online B2B stores being launched in the future. And that’s great! But there are also new systems on the horizon for which I am curious about. We will see what it bring us ;-). Muneeb: How important are Magento events for beginners as well as experienced Magento people? Ray: Ever since day 1 of the first ever Meet Magento event I attended in Utrecht, Netherlands, there was this vibe I got that was indescribable. Everybody was sharing their personal Magento stories with incredible passion. And this never stopped. I have attended so many events over the last 10 years (Meet Magento NL, DE, DK, CH, ES, PL, BE, Bargento, Magento Developers Paradise, Magento Snowcamp, Magento Live, Magento Imagine….and much more), and every time I meet old and new friends. There is no gap between the early adopters and the beginners. And this is what’s so cool about this community, everybody is equal. The most important thing I think is ‘sharing and caring’. Being open minded during those events will gain you so much more and fun while working on Magento projects. So jump out of your chair, and book a ticket to a Magento event, and let’s meet up and share your Magento stories!. Muneeb: Everyone has some inspirational personality in their life. Name some people who have inspired you in your personal and professional life? Ray: This is a hard one, let me think! Well, over the years I have met lots of people at events or read about in books who have inspired me. Here is a small list of people I have met who are an inspiration to me:Dan Kaminsky (Discovering the 2008 DNS cache poisoning vulnerability), Johnny Long -(Google hacking), Steve Souders (High Performance Web Sites), Maximiliano Firtman (High Performance Mobile Web), Yoav Kutner (Former CTO of Magento), and Roy Rubin (Former CEO of Magento). I have met Dan and Johnny at Defcon, and are a great inspiration for all the “hacking” they have done. They taught me that it is good to share and always think out of the box. I have met Steve and Max at Velocity, Webperfdays, and many more events. They are a great inspiration for learning how the browser really works performance wise. And last but not the least, Yoav and Roy. The first time we met was during the first Meet Magento event in Utrecht. For four days straight I drove them across the Netherlands and we talked about Magento. I was really inspired by what they have done; building a brand new open source system and sharing this with everybody. Thanks, Yoav and Roy for being an inspiration. Muneeb: How do you spend your free time? Do you like watching movies, playing games, or something else? Besides Magento and sports, I love to work on my private project ‘Mage.coach’, a performance analysis tool which can be used on Magento projects, or organizing the Magento User Group and WebperfDays Meetup in Amsterdam. Playing games is not for me, I rather go out and see a movie or music concert by myself or with friends. Shopify or PrestaShop? Well, none of those ;-) But if I have to choose, it’s PrestaShop. It’s open source, and has no default privacy issues like Shopify”. Muneeb: Lastly, who would you like to nominate for an interview on Magenticians? Ray: I would nominate the following: Vladimir Kerkhoff, Anna Völkl, Sherrie Rohde, Talesh Seeparsan, Thomas Fleck, Thomas Goletz, Rico Neitzel, Vinai Kopp, Tom Robertshaw, Ignacio Riesco, Kimberely Thomas, Kalen Jorden, Phillip Jackson, Alan Storm,…………and the list continues! Since there are so many nice Magento folks out there, I would love to have them all in here. And that wraps up our interview with another great guest. To see more insights from Ray, follow him on LinkedIn and Twitter. So what were your thoughts? Are you a beginner looking to climb the career ladder in the Magento industry or more interested in switching to Magento for ecommerce? Let us know in the comments below.